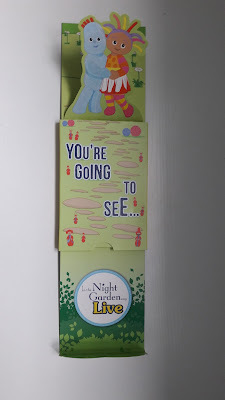 Last year we took Blake to see In the night garden live. Blake loved it so much that we knew that we would definitely have to go again. we are excited to be able to go again this year. If you fancy going than u can get £5 off by entering EARLY84Z at the checkout. Last year we traveled to Manchester but to save too much of a journey we are going to be attending the the one at Richmond Old Deer Park. This is a much nearer location for us and will mean hopefully not having to stay overnight anywhere. Our tickets arrived in the post just the other day and we love the design of the packaging which makes if special. This will definitely be stored in Blake's memory box for him to look back on when he is older. Will you be going to In the night garden live this year?